The Protection of Environment (Rabacca) Order, Number 2 of 2011, which was gazetted on Friday, February 11, prohibits the company from doing any further mining at Rabacca and listed a number of reasons which prompted the Physical Planning and Development Board to take such action. On Tuesday, February 15, when SEARCHLIGHT visited the project, Joseph said in his opinion, the Governmentâs mining operations in the Lady Jane River (a dry river) and those of a private operator, OECC, at Rabacca are more detrimental to the area than Bigger Trucking and Blocks Construction Company Limited mining. âOECC and Government pose more threat to the river than Bigger Trucking because they operate in the river. We donât operate in the river,â said Joseph. âI invite you to come see who is threatening the river, whether Bigger Trucking or BRAGSA,â said Joseph. He told SEARCHLIGHT the company started experiencing problems from a Government Minister as early as the first week of operations. âI find that we last this long…three years is a long time,â said Joseph. He said moves are being made to block Bigger Trucking and Blocks Construction Company Limited because it is competing with the Governmentâs sand mining project also at Rabacca. Joseph contended that when Bigger Trucking and Blocks Construction Company Limited started its operations in 2008, the Governmentâs statutory body, GESCO, was selling sifted Rabacca at a cost of $46 per yard. âWe knowing the plight of the people, we started at $15 a yard. 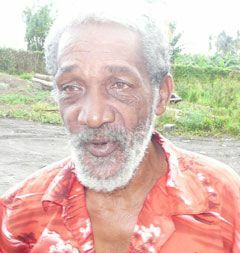 And up until now, they tell us that we got to stop mining, we havenât reached $46 a yard,â said Joseph. Prices for sand from Bigger Trucking and Blocks Construction Company Limited had hit $25 a yard, but by January 6, a new price figure of $35 a yard was introduced. The Governmentâs price has fallen to $20 a yard. When asked if the increased cost of sand could have caused the Government to take action against the company, Joseph said no. âI donât think that could have been a factor, because three years after, we ainât reach $46 a yard. Sharing his view on the Physical Planning and Development Board claim that Bigger Trucking and Blocks Construction Company Limited use and disposal of the petrochemical compounds is not controlled and there is evidence that the oils and diesel have gained access to the ground water table, Joseph said this is not factual. âThe containers are not disposed of, but they are there to be disposed of. Itâs just diesel and oil we maintain the machines with. There is no other form of pollutants,â said Joseph.